One Systems is pleased to announce the US debut of the all-weather 118IM-Sub at InfoComm Booth C12108. 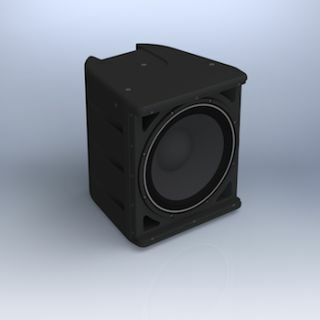 It joins One Systems' line of copolymer based all-weather loudspeakers. "This subwoofer provides systems integrators with extended low end in a very small footprint," explained One Systems president Doug MacCallum. "It has a tremendous output to size ratio and is optimized for long life in rain, snow, high humidity, high heat or indoors." The 118IM-Sub is built using the One Systems 18I/O 18-inch (457 mm) extended bass transducer featuring its patented Inside/Only (I/O) voice coil design. The medium-density polyethylene enclosure is optimized for high UV exposure and harsh environments. Its compact size, measuring 23 x 20.1 x 20.7 inches, has a frequency response (+3 dB) of 40Hz - 120Hz and a coverage pattern that is nearly 100% omnidirectional. It is also designed to be pole mounted for easy use in stadiums and amusement parks in conjunction with One Systems full-range weatherproof speakers. All external rigging and suspension hardware, as well as the metal grille, are built using 304-grade stainless steel. The structural internal rigging is made with high-strength aluminum. The grille is a 3-layer "rain shield" design minimizes direct rain contact with the system's transducers. The unique vent design also allows for easy moisture drainage from the interior of the enclosure. The 118IM-Sub is designed to IEC 529 IP45 (solid object penetration to 1 mm (0.04 inches) and water jets from any direction). The enclosure and components are also designed to Mil Spec 810. The input section consists of a 5-pin barrier strip. A weather cover is provided with an integral gland nut connector for outdoor applications. The gland nut is weather proof and is rated NEMA 6P (IP68). The connector will accommodate cable outside diameters from 7mm to 12mm (0.236" to 0.472"). The maximum diameter will accommodate most 2 conductor AWG 12 cable assemblies. The 118IM-Sub will be available in late August, 2014.